Achieving spinal health with a minimally invasive approach involves a collaborative effort. Dr. Khajavi believes in the importance of working with his colleagues in all aspects of the medical arena, as long as the patient’s health remains as the top priority. Exploring conservative measures, such as chiropractic care, is a large facet of this belief. 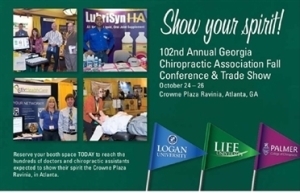 This past weekend, Georgia Spine & Neurosurgery Center attended and participated in the Georgia Chiropractic Association’s 2014 Fall Conference and Trade Show in Dunwoody, Georgia. This conference was the 102nd annual event for the organization and Dr. Khajavi’s second year in attendance. Alongside other physicians dedicated to spinal health and the chiropractic specialty, Dr. Khajavi personally helmed a booth and showcased his approach to alleviating back pain. He was the only neurosurgeon in attendance as one of the vendors, and successfully communicated his unique method in upholding a truly minimally invasive approach to the field of neurosurgery and spinal health. For more pictures, check out our Facebook Page!